Natural, holistic and humane dog training that takes place in the family's home. Bark Busters at-home dog training was founded 30 years ago and has quickly spread throughout the world. Operating in the US since June 2000, Bark Busters has offices in 40 states with more than 350 franchise locations worldwide. Bark Busters Dog Behavioral Therapists have trained over 1 million dogs worldwide, making Bark Busters the global leader in dog training. No matter what country they live in, all Bark Busters therapists share the same passion and mission; to help families enjoy their pet dogs by providing dog behavioral therapy and training using natural, holistic and humane techniques in the family's home. We invite you to discover why dog owners around the world have come to understand and value Bark Busters' successful methods of "training dogs the Aussie way"! 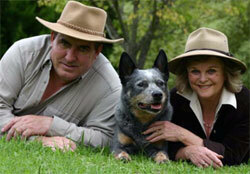 Bark Busters was founded in Australia 30 years ago by Sylvia and Danny Wilson, both expert dog trainers. During her 10 years managing an RSPCA shelter, Sylvia would observe and analyze the behavior and communication methods of the hundreds of dogs that came into the shelter. Saddened that so many dogs were abandoned or euthanized for behavioral issues, Sylvia knew these problems stemmed from a lack of consistent leadership. She also knew that she could help resolve them. Thus the Bark Busters method was born. This highly effective method is based on unique, natural, dog-friendly training techniques, as described in Sylvia and Danny's numerous books including Training Dogs the Aussie Way, a practical guide for dog owners. Bark Busters teaches dog owners about the canine psyche and how to train dogs using voice control and body language, with the goal of putting the owner in control through effective leadership. Today, the Bark Busters training method has been used to train more dogs worldwide than any other method - and hence has saved countless dogs' lives. What makes us different? Developed in Australia, our simple, natural and dog-friendly training techniques use the same communication methods - body language and voice control - that dogs follow in their instinctive pack mentality. With training taking place in your home, you'll see amazing results with your dog in as little as two hours (not weeks or months offered by other methods). Plus, you'll see continued improvements in your dog's behavior with practice and time. A Bark Busters Dog Behavioral Therapist will come to your home where your dog is more open to learning and where he exhibits most of his problem behaviors. We teach you how to train your dog through effective use of your voice tones and body language. Our technique puts you in control using non-physical, quick and easy methods that dogs and puppies need to feel comfortable and secure. Your Bark Busters trainer will help you to better understand and manage your dog's behavior, yielding an enhanced relationship that is more relaxed and enjoyable for you, your family and your dog. As a world leader in dog training, Bark Busters' mission is to promote clear communications between owners and their dogs using simple, effective, and natural training methods that appeal to the canine psyche. Through the professionalism and commitment of our network of dog behavioral therapists, we work to enhance the human-canine bond thereby reducing the possibility of maltreatment, abandonment and euthanasia of companion dogs.